Product Empties Volume 5 | Vanity and Everything in Between. It's always a delightful feeling every time I finish a product. Over the years, I have realised that I never really use too much product even if I think I do. I still don't know why although I'm guessing it's because I don't want too much gunk (on my face, skin, and hair except for hair conditioner). 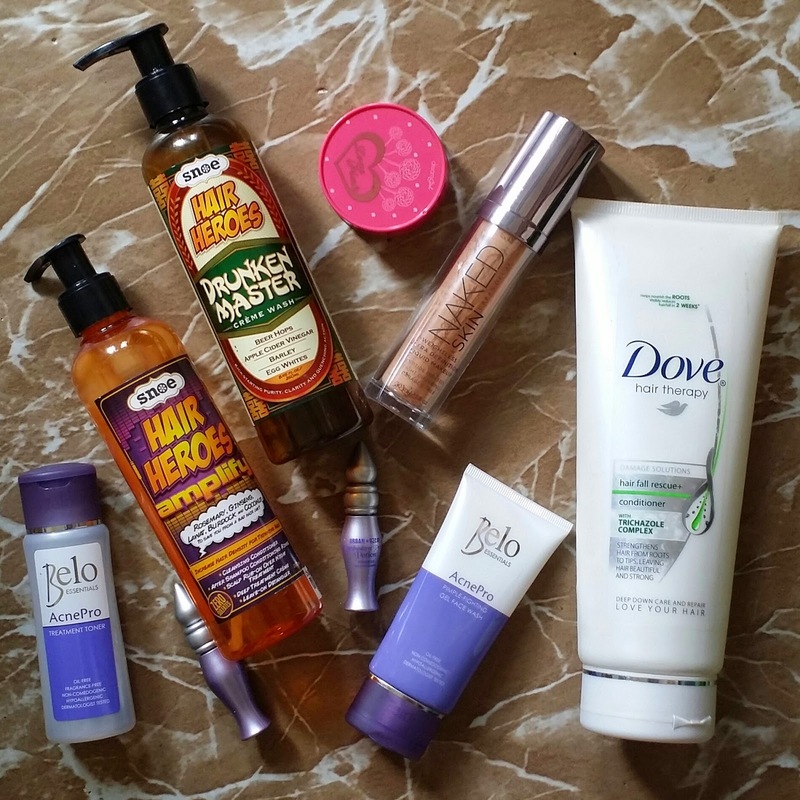 It's already mid-October and I'm guessing this is going to be my last Product Empties post for 2014. Yep. So, let's start shall we? 1. 4u2 Loose Face Powder, PhP189 - this is my 2nd loose powder from 4u2. What I love about this product is that it gives me the coverage I need. I'd say it can go from light to heavy depending on how much you will apply on your face. This powder lasted a year on me. I used it frequently then switched to other setting powders then went back to this again. It comes in 3 shades and I use shade #2. 2. Urban Decay Naked Skin Foundation, PhP1900 - this is also my second empty liquid foundation from Urban Decay. I love using this foundation but had to stop using this when the bottle was already half empty because there's no Urban Decay here in Manila. It's hard to get a hold of this so I had to alternate this with other other foundations that I have. I use this on a daily basis and even for special occasions. That's how much I love this product. This is also my go-to foundation when I can't think of what look to pull. A perfect base always sets the mood for makeup to be perfectly done, right? 3. Dove Hair Therapy Conditioner - I recently got a haircut almost a week ago. Before having a haircut, my hair was below my waist. It was that long. No exaggeration. I grew it that long so it would be easily styled on my wedding. There's just so much you can do with a very long hair. This conditioner was emptied faster that I thought. Although I'm guessing it's because of my uber long hair. I love Dove hair products because they smell so good on my hair and the scent stays for a long time, too! I don't know anyone who doesn't like Dove! 4. Belo Essentials AcnePro Facial Wash and Toner - These two products became my staple until I finished them. I liked the effect it gave my skin ever since I started using it. I'm thank for my Sample Room family for giving us first dibs on these products because even though it can be bought easily, the efficiency of the products aren't compromised. I swear these products got rid of my zit on my chin. It also lightened my dark spots! 5. Urban Decay Primer Potion - Well, these two primers actually dried up! Lol! 6. Snoe Beauty Shampoo and Conditioner, PhP599 each - I'm just glad I finally finished these hair products. I can't stand its smell but I still used it because it's freaking PhP599 each. That's it for my Product Empties! Let me know if you also keep track of the products you finish. I'd love to know your thoughts. You have been using some really good products, too bad urban decay primer portion dried up!